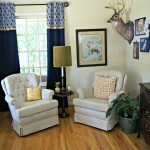 You may have seen a glimpse of my newest love on our Summer Home Tour last week. It’s our Navy Kitchen Chandelier. 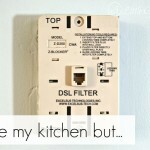 Updating our kitchen has been on the top of my list for a long time. 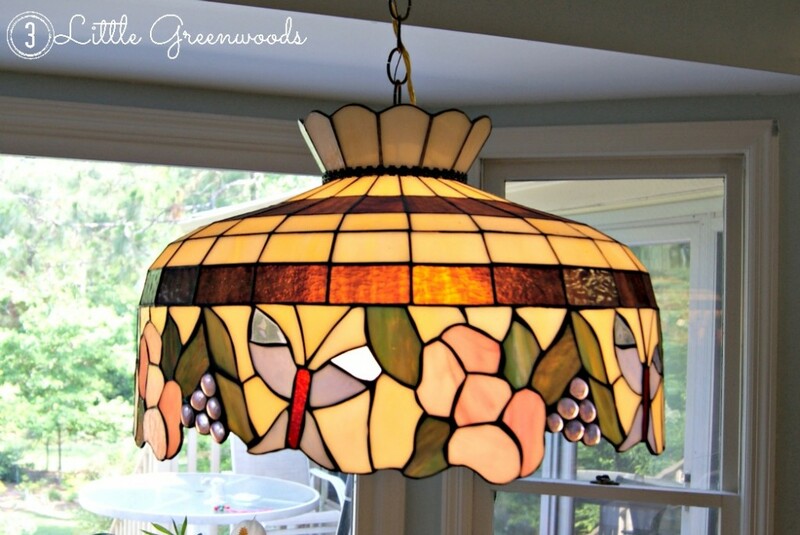 One of the pieces that had to be replaced was the lovely stained glass pendant that hung over the kitchen table. Here it is in all it’s flowers and grapes and butterflies stained glass glory. The stained glass was totally not jiving with the light and airy coastal feel I am going for. So when I stumbled across a “damaged” kitchen light fixture in Home Depot I couldn’t resist taking a peek. Honey and I were shopping for plants for our garden after our anniversary dinner date when I pulled him over and demanded asked sweetly for him to open the box. This post contains affiliate links marked with asterisks. Click here for my full disclosure policy. Inside was a mottle brown fixture missing one of the glass shades. 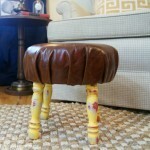 It had a great shape and was the perfect size for over the kitchen table. It was also marked down 20% making it $30. The chandy looked just like this 5-Light Chandelier* . When I casually mentioned to Honey I wanted to buy it, add new glass shades, and I would be spray painting a chandelier navy, he quietly shook his head then loaded the box into the buggy. Seriously love that man! I couldn’t wait to whip out some spray paint on that puppy! 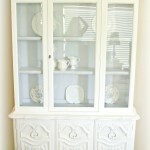 But first I removed the glass shades and carefully cleaned the entire piece with soapy water. 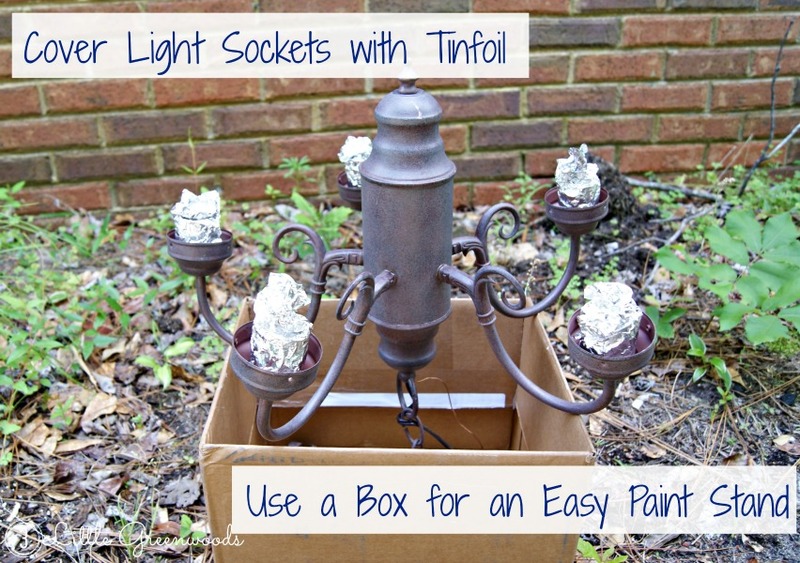 Then I covered the light sockets with tinfoil. Outside I used a medium sized box for an easy paint stand. Let me stop for a minute to rave about this spray paint. Rust-Oleum Painter’s Touch Multi Purpose Spray Paint in Navy Blue* is the best ever. Usually there are drips all over everything I spray paint. But this stuff makes me look like a pro. It has awesome coverage and no drips. Anywhere. Out in the sunshine, the actual color of the paint may be a bit brighter than the top of the can but I really, really like it. Don’t forget to cover up any wires or connectors before painting! It’s not much fun scraping away layers of paint while you are holding up the fixture with one hand during installation. Sorry Honey! Inside the kitchen, the chandelier totally looks navy. The Clear Seeded Bell Shades* were a fantastic replacement of the dingy, frosted ones the fixture originally came with. The seeded glass shades were a splurge since five of those cost as much as the fixture itself. But I love how sparkly they look. 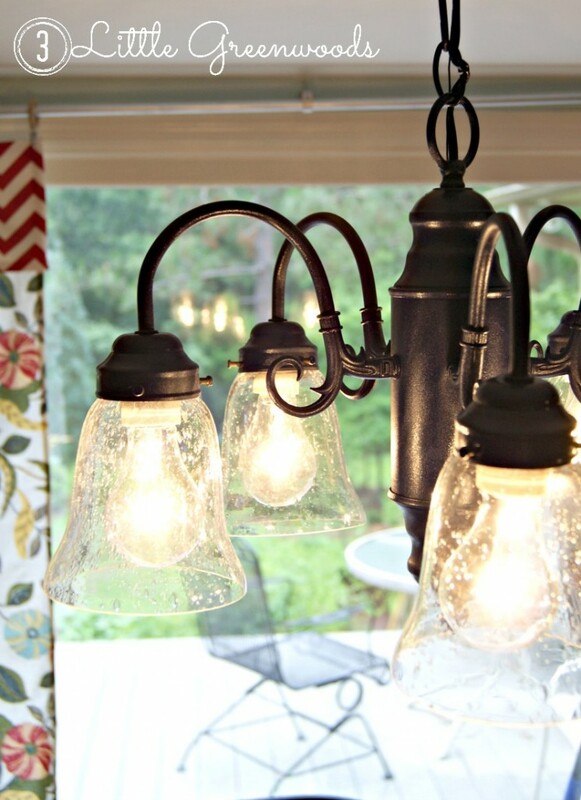 Clear light bulbs provide a ton of light for homework and family dinners. The total cost for this project was about $70. Not too shabby for spray painting a chandelier. Bet I’m the only one on the block who has a Navy Chandelier! Thanks to the new Kitchen Hutch and the Navy Chandy, our kitchen really is turning into a Space to Smile About! If you spent you anniversary at a luxury spa or a Mexican getaway instead of at Home Depot buying plants and returned light fixtures ~ just keep that info to yourself. Mmm ‘kay? 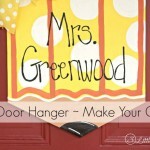 Follow Ashley @ 3 Little Greenwoods’s board Party Planning on Pinterest. Thank you so much! I love my navy chandy! Oh girl, if only I had known about this at our last house. I wouldn’t have had to live with a brass version of that monstrosity for 4 years! It made me SO happy to take down that ugly light! My new navy chandy looks awesome in my kitchen! Thanks for the comment love! Deonna ~ paint that sucker! I’m in love with mine! I love the navy color. You did a great job on the makeover! I also loved the house tour! As always you make my heart happy with your sweet comments! Enjoy your well deserved summer break! I love anything that is about decorations. In fact I have a chandelier in my utility that I need to update with paint. I see how you have done this so it makes me want to go and buy the paint. I also love old houses which have been restored or being restored…like this This Old House Restoration. Thanks so much for sharing this with us. I love it!! Ahhhhmazing! I love it! You did a great hob. What a great color too. Thanks so much Leslie! It looks sooo much better than the original fixture. I love it and love the color. It makes a beautiful addition to your kitchen. I’ve never tried that brand of spray paint, but will be sure to check it out. Thanks for the tip! And girl, if we were neighbors I would have given you one that I found at a garage sale for $5!! Rustoleum is the BOMB! Not as many colors as Krylon but the coverage is amazing. And no drips! For the record, I did a comparison with Krylon and Rustoleum 2X on a piece of bamboo. Rustoleum won hands down – seriously twice the coverage, no runs, drips or errors. Thanks so much for sharing your spray paint experiment results with me! What’s the last thing you painted with it? It turned out GREAT! 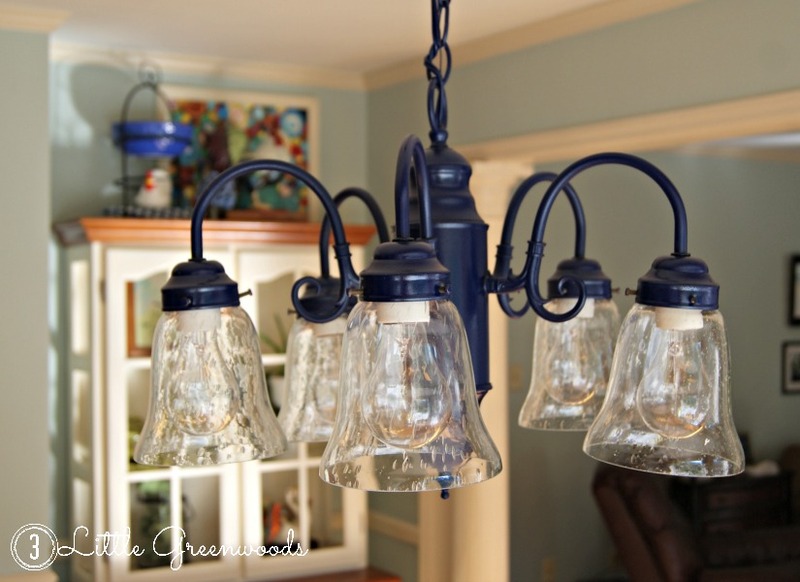 I love the seeded glass globes and the navy color – very nautical. I have to agree with you about the Rustoleum spray paint being the best too. I’ve spray painted a ton of stuff and it really is superior. This is so cute! I love the colors you used. It was so fun doing the hop! So cute!!! I l love the navy look with the sea glass! The navy is perfect for my kitchen! The color looked way brighter outside but inside it’s deep blue. Go paint something fun! Table in the sitting area off my kitchen. 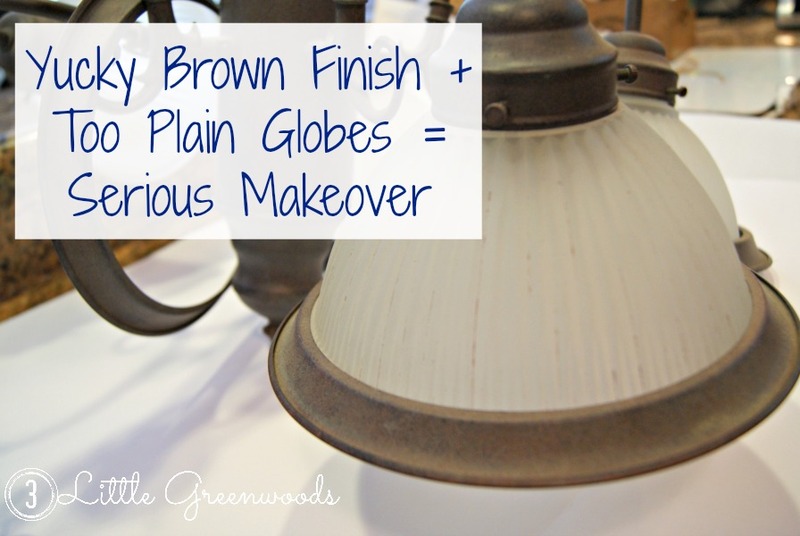 Your lighting fixture looks so beautiful now-that colour is stunning! Great job. If you have a minute to spare I’d be so thrilled if you could pop by and share your post at my weekly Say G’day linky party. It’s on now and this would be a fabulous addition! Honey sounds like my hubs…nodding his head when I tell him about one of my projects. I love the color and the seeded glass shades! So gorgeous and it works perfectly! Honey knows me so well! 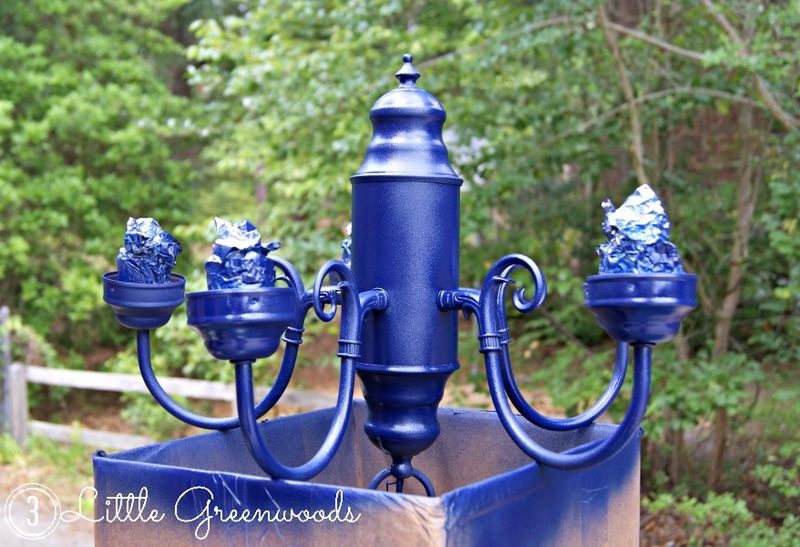 So excited you like my navy chandy! 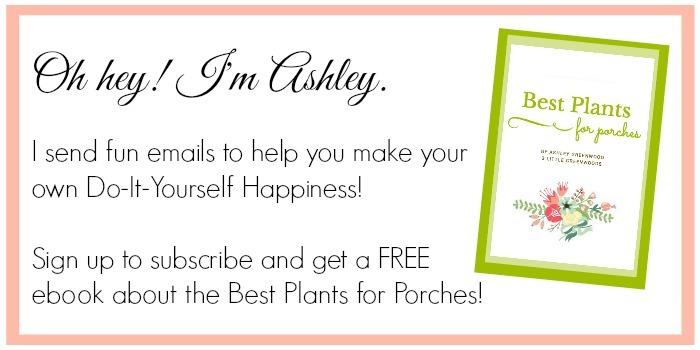 I think it is so boss that you did this–and it looks fantastic, Ashley! I know I love it too! I’m the Kitchen Chandy Boss! Ha! Great idea. I use Painter Touch for everything I repaint! 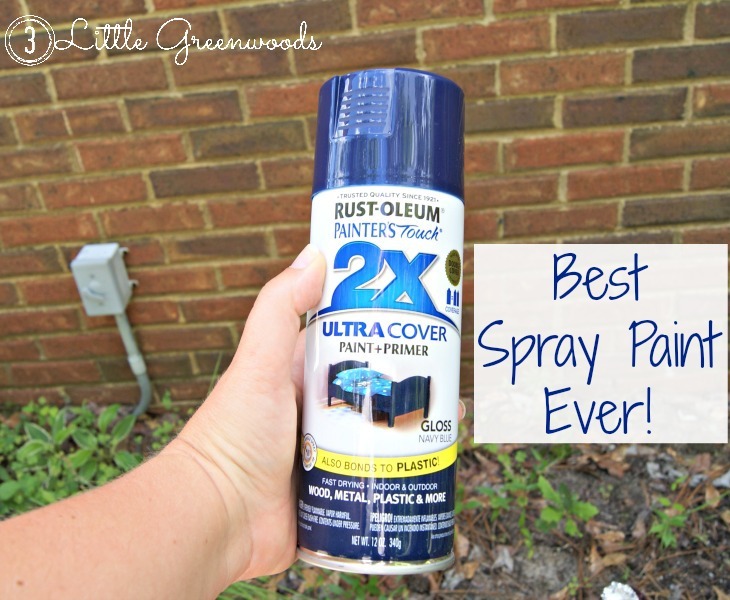 I agree–that Rustoleum spray paint is the BEST! It goes on so easy and has great coverage! 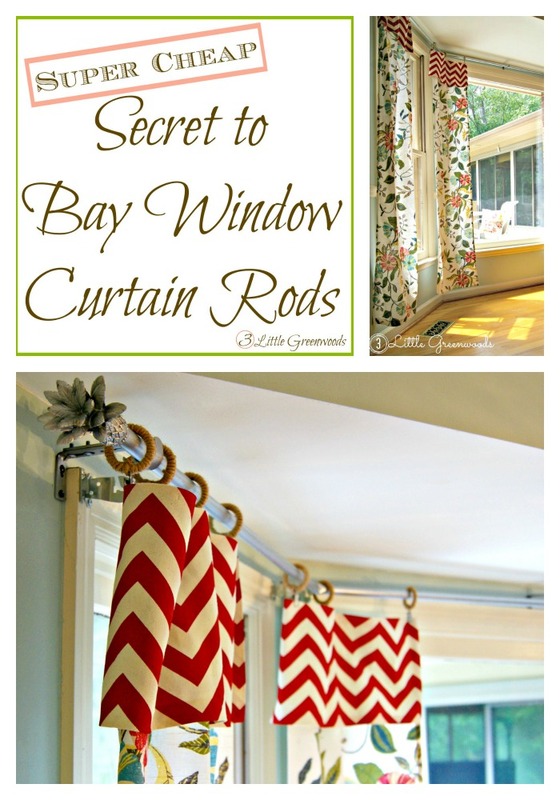 Thanks so much for sharing this at Frugal Crafty Home! Seriously… the best spray paint ever! I had always reached for Krylon because of the awesome colors but the paint *always* dripped. Thanks so much for hosting! Ashley, I really love how you revamped this chandelier… you have great taste in color, too! Hey Gloria! I so happy you love my new kitchen chandy. The color red was my first choice but I thought Honey might keel over if he came home to a red light fixture to hang up. 😉 I’m so happy I went for navy instead! Fabulous makeover!! I have almost the same light fixture and was thinking of how I can update it..I didn’t know you could switch out the glass over the light bulbs!! Genius! Pinned! l love your chandelier!! I need to do this with my dining room chandelier, thanks for the inspiration. I would love it if you linked this up to my Motivate Me Monday linky party at IT’S A ginger SNAP. Stopping by from Creative Spark. Great tutorial. What a difference you have made from boring to BAM! Would love it if you could stop by the Wonderful Wednesday Blog Hop (going on now) and Link up this fabulous post. I think it would be a big hit! Happy you could make it to the Wonderful Wednesday Blog Hop today! “Triple the Love” headed your way! Have a wonderful 4th of July weekend. Love your fun party! Hope your holiday weekend was awesome! Love the makeover Ashley!!! It’s so much better 🙂 I just found an awesome light for my kitchen that will need to be spray painted so this was very timely! Painting the chandy was such an easy update! I can’t wait to see your project! I love, love, love your chandelier. You did an amazing job. 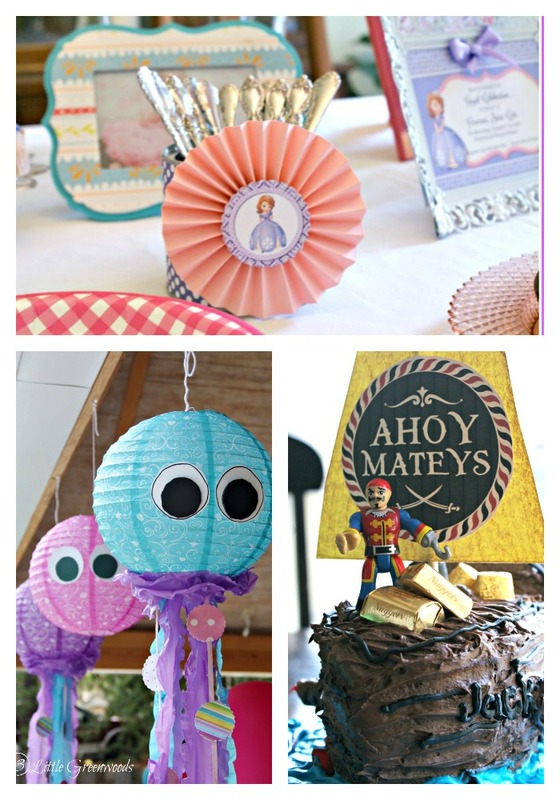 Thanks for linking up to the Tips and Tricks Linky party. Hey Julie! 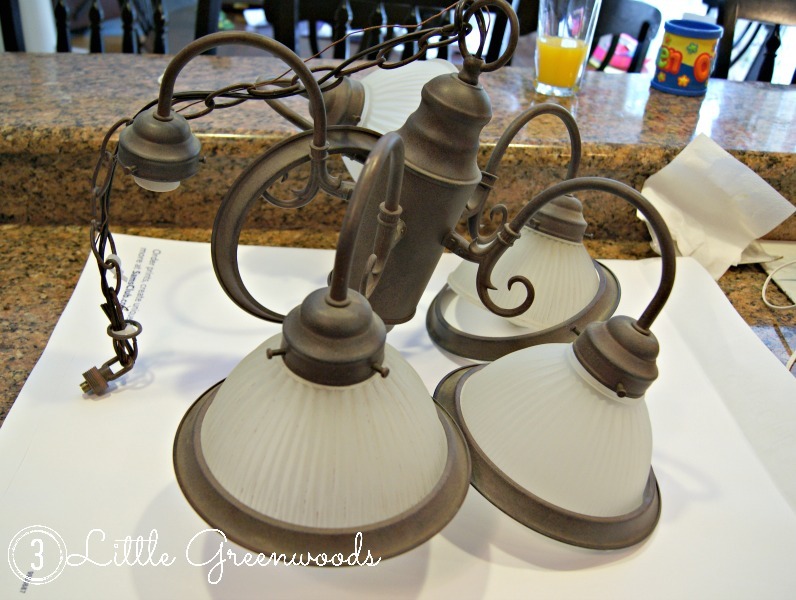 Thanks so much for the kind words about my navy chandy! Love love love the chandelier!! Thanks for sharing at our Motivational Monday party! Found this post on Hit Me with Your Best Shot. I love this and the color is wonderful! I need to start looking at things with a different eye. And I love those glass shades too. Awesome job! So excited that you found me and that you love our Navy Chandy! Thanks so much for the bloggy love! Thanks so much for leaving some comment love. I’m still in love with my navy chandy too! We have this exact chandelier in our dining room and I was wondering if I could update it easily and inexpensively before we list our house in August. This is PERFECT! I don’t think I will use blue considering, but just updating the color and glass will really make an impact. I’ve been looking all over for some replacement globes just like the ones you used on your navy chandy. Where did you find them? I saw your post earlier this year. We had the same builder grade (ugly) light fixture in our kitchen. Love, love, love how your idea transformed our little kitchen area. We went with black rather than navy blue and it looks great. I found the seeded globes at our local Lowes – I believe they were even available on line. Thanks for the great idea! YAY! Thank you so much for sharing! I’d love for you to post your “new” chandy over on my Facebook page so everyone can see how awesome the power of paint is! I am CONSTANTLY spray-painting flowerpots and other garden accessories I don’t like; why on EARTH have I never thought to do this with that GOD-AWFUL chandelier in the dining room??? Isn’t spray paint the BEST?! So happy you have been inspired. 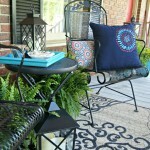 I’d love for you to share one of your spray paint projects on my Facebook page! Love the fact you spray painted your chandelier. I recently bought one that was already painted, it is pink, sort of but not quite hot pink. It was on sale for $30, and was exactly what I was looking for. I recovered shades for it and will get it up tomorrow. The one it will be replacing will be painted and hung in another room. I use a lot of paint, spray and other, on different projects around my house. YAY! So happy you found a chandy that was just what you were looking for. Spray paint is my best friend on all sorts of home decor projects!